Let's face it - not all customers are desirable ones. Screening the undesirables out on the front end is ideal, but sometimes you instead have an "Oops!" moment after the customer has been onboarded. Perhaps the customer was perfectly acceptable at the outset, but months or years down the road changes in the way the account is used or managed cause problems, concerns, or extra work, turning the account's economics upside down. There are many reasons your bank may wish to break up with its customer. Before you send that "Dear John" letter, however, you want to ensure you have carefully considered all the relevant legal and practical issues with your intended course of action in order to minimize post break-up fallout. This program provides a framework for off-loading customers you no longer want to serve, and it provides some important reminders about instances where closing an account is not the right course of action. We'll talk about how to determine whether to provide advance notice and, if so, how much. We'll explore reasons why "less is more" in your explanation to the customer. You'll hear about situations where you should not communicate with the person who opened the account. And we'll talk about red flags that should prompt you to give the customer the boot. In this comprehensive webinar, we dissect more than three dozen account closing issues! When it's time to kick the customer to the curb and rid yourself of a headache or potential liability, you want to make sure you're taking the proper steps, the proper way, at the proper time. This program tells you how to do it. What legal authority do you have for closing an account? What does your deposit account agreement have to do with it? Do you "owe" your customer an explanation? Words that can come back to bite you. In what instances can you close an account without advance notice? When you must give advance notice, how long is sufficient? What negative consequences could the customer suffer from account closing and how do you mitigate them? What if the "customer" is discovered to be an identity thief? How do you protect the bank against losses in connection with a closing? When do you need to alert law enforcement you're thinking about a closure? What should you do when an awaited TIN never arrives? Rejecting an account when the would-be customer balks at CIP. Determining when a TPPP needs to be given the heave-ho. Danger zones when someone other than the account owner wants to close the account. What to do when you discover the customer has defrauded you. "Phantom" customers and why you must rid yourself of them. When it's awkward - getting through it. When recurring suspicious activity is motivating you to want to close an account. You have a check kiting customer - don't be the last to act. What the regulators say about de-risking. When you experience that "Oh, no!" moment. Understanding a "semi" closing - and when to use one. Closing an account for excessive overdrafts. Saying "Sayonara" over failure to comply with CTR info requirements. Closing an account after a customer dies. Closing an account and opening a new one for audit trail purposes. When the customer's account info has been compromised and you need to close. Cutting off the account when the customer has exceeded the covered transactions limits too many times. Getting the custodian to close the UTMA account when the kid is grown up. No, you aren't supposed to close an account when the customer's name appears on these lists. When the depositor who's closing an account has a loan with a rate dependent upon auto debits. When parties in interest are fighting and you're in the middle. Closing a new account when mail is returned. When the customer is just a creep. They used to be fine, but now the customer is doing bad things. How a customer's auto debits and direct deposits may factor in to what you do. Closed means CLOSED, even when it's tempting to accept a deposit. Things to watch out for when reporting the account to a credit reporting agency. When scammers have your customer on speed-dial. This program is designed for everyone involved in making decisions on account closures and implementing those decisions. About the Speaker: Mary Beth Guard is one of the four co-founders of BankersOnline and is now Editor Emeritus, after more than 16 years of serving as Executive Editor. She was instrumental in the creation and expansion of BankersOnline, as well as the launch more than a decade ago of BOL Conferences, Inc. and its continued operation and growth. Mary Beth is also the director of BankCompliance.com, the premier subscription-based compliance service now being offered online. Also, Mary Beth serves as CEO of Glia Group, Inc., which produces BOL Learning Connect. For more than three decades, Mary Beth has utilized her background as an attorney to focus on banking industry issues, first as general counsel for the Oklahoma State Banking Department, then as general counsel for the Oklahoma Bankers Association, prior to her work with BankersOnline. 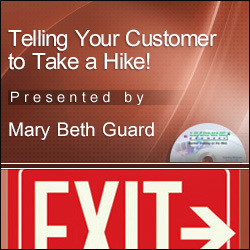 Mary Beth has presented training programs for virtually every major national financial industry association, as well as more than a dozen state bankers associations and a host of other organizations. She is a frequent presenter of webinars and seminars. 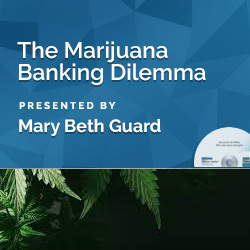 In addition, Mary Beth has written more than a thousand banking-related articles and is BOL Guru #1. This program was recorded in its entirety in October 2018. The CD-ROM includes program slides, materials (if available) and follow-up Q & A document.